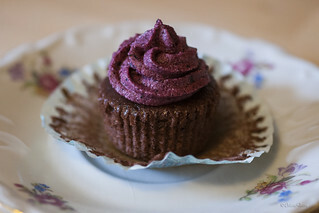 Blueberry velvet mini-cupcakes with blueberry cream cheese frosting | SMØRGÅSBORD! 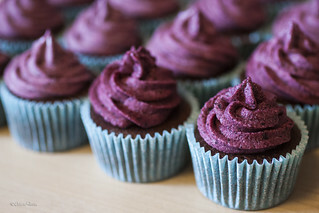 if using a purple dye along with the natural purple colored juice of blueberries would make the cupcakes also purple. 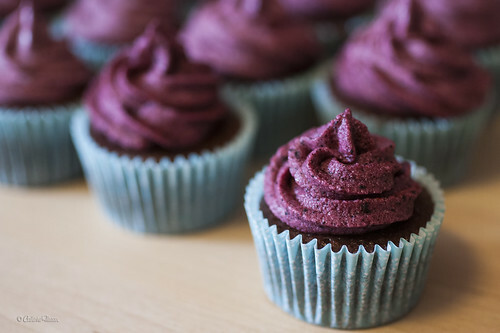 So, yesterday I baked a batch of blueberry-flavored purple velvet mini-cupcakes with blueberry cream cheese frosting. In the bowl of an electric mixer, cream together the butter and sugar at medium-high speed until light and fluffy. Turn the speed to «high» and add the egg, beating until well-blended. In a separate small bowl, mix together the cocoa powder, vanilla essence, blueberry puree, blueberry essence and food coloring to form a paste. Add this paste to the batter and mix at medium speed until thoroughly combined. Reduce the mixer speed again to «low» and add the salt, baking soda and vinegar. Turn the speed back to «high» and beat for another couple of minutes until the batter is thoroughly combined and smooth. Add the cream cheese. Beat until well-blended, then gradually increase the speed to «high», and continue beating until light and fluffy. Scrape down the sides of the bowl with a rubber spatula when necessary. Add the freeze-dried blueberries, and continue beating at low speed until just blended. Frost each (completely cooled) cupcake with the prepared cream cheese frosting. You can use a piping bag, or you can simply spread the frosting on top—works either way. As you can see, the cupcake itself did not turn purple at all—at least not the way I had expected… So, I guess it’s better to just stick with just using the red dye. Who knows, maybe it would turn more purple, given the blueberry puree’s natural vivid color.